Sporting Alert – Scores and results from the AP top 25 college football games that took place on Saturday. COLUMBUS, OH – No. 1 Ohio State laboured to a 20-13 victory over Northern Illinois in their college football game at Ohio Stadium on Saturday. The Buckeyes played out an unimpressive 10-10 opening two-quarters before scoring 10 more points in the second half, but failed to score in the fourth quarter. J.T. Barrett and Cardale Jones shared the quarterback duties, with the former taking over most of the ball distributions in the second half and went 11 of 19 for 97 yards and a touchdown. Starter Jones threw two first half interceptions and went 4 of 9 for 36 yards in an unimpressive Week 3 win. Darron Lee returned an interception 41 yards for a touchdown, while Ezekiel Elliott ran for 108 yards and Michael Thomas took three catches for 60 yards and a touchdown for the top-ranked defending national champions. Ohio State head coach Urban Meyer credited Northern Illinois for their battling display, but admits his team still has a lot of work to do in the coming weeks. TUSCALOOSA, Ala. — Chad Kelly went 18 of 33 for 341 yards and three touchdowns and ran for another score as No. 15 Mississippi upset No. 2 Alabama 43-37 on the road in a college football game Saturday night. Cody Core took four catches for 123 yards and a score, while Laquon Treadwell caught the ball five times for 80 yards and a touchdown and Quincy Adeboyejo had two catches for 71 yards and a score in the win for Ole Miss. The Rebels, who also upset the Crimson Tide last year, were picking up their second victory in Tuscaloosa, since 1988. Richard Mullaney had seven catches for 61 and two touchdowns for Alabama, which never recovered from its first half turnovers, which allowed Ole Miss to build the lead steadily. EAST LANSING, Mich. – Connor Cook threw four touchdown passes for 247 yards and no interceptions and No. 4 Michigan State beat Air Force 35-21 on Saturday. Cook, who went 15 of 23, threw three of his four touchdown passes in the first half, including two in the second quarter, as the Spartans (3-0) dominated the opening two quarters and led 28-7 at halftime. Aaron Burbridge, who took a sensational catch off Cook in the second quarter, finished with three touchdowns and took 8 catches for 156 yards. The win saw Michigan State improving to 3-0 on the season, following earlier victories over Western Michigan and Oregon. Jalen Robinette took two catches for 82 yards and a touchdown for Air Force (2-1), while Benton Washington carried the ball 7 times for 52 yards and a score and Jacobi Owens rushed for 72 yards. Quarterback Karson Roberts threw for 149 yards and a touchdown for the Falcons in the defeat. SOUTH BEND, Ind. — Senior running back C.J. Prosise travelled for 198 yards and three touchdowns, including a score for 91 yards in the fourth quarter, and No. 8 Notre Dame got the better of No. 14 Georgia Tech, 30-22 on Saturday. After Patrick Skov ran for a 5-yard score to even the scores at 7-7 in the second quarter, the Fighting Irish (3-0) scored the next 23 points of the contest, with Prosise finding the end zone twice in the fourth quarter. Skov also scored two touchdowns in the final quarter, but the Yellow Jackets’ (2-1) powerful offense was unable to put back to the big lead and they dropped their first game of the season. EUGENE, Ore. — Junior Jeff Lockie stepped in for the injured Vernon Adams and powered No. 12 Oregon to an unmatched 61-28 win over Georgia State in their college football battle at Autzen Stadium on Saturday. Lockie passed for 228 yards on 23 of 31 and two touchdowns, while Royce Freeman ran for 101 yards and a scored and Taylor Alie rushed for an 81-yard score in the fourth quarter in support, as the Ducks (2-1) bounced back from the 31-28 defeat at Michigan State in Week 2. Oregon, which scored steadily throughout the contest, built a huge 33-7 lead at halftime, which ultimately setup the victory. Nick Arbuckle threw for 318 yards and three touchdowns, and Penny Hart had nine catches for 128 yards for the Georgia StatePanthers (1-2) in the defeat. 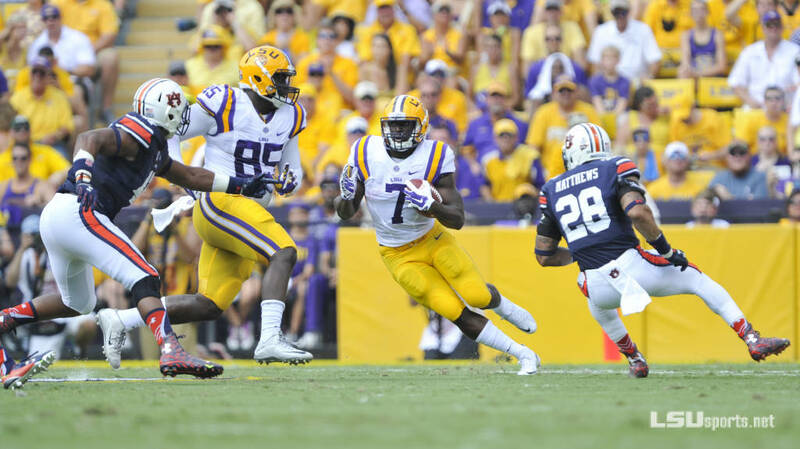 BATON ROUGE, LA – Sophomore running back Leonard Fournette ran for a career-high 228 yards and three touchdowns in powering No. 13 LSU to a convincing 45-21 win over No. 18 Auburn at Tiger Stadium. Fournette, who tallied 159 yards and three scores in Week 2 against Mississippi State, rushed 19 times, including a 71 yarder. Brandon Harris threw for 74 yards and a touchdown and carried the ball 8 times for 66 yards and two scores for the LSU Tigers (2-0), who finished with 485 total yards, including 485 rushing. Jeremy Johnson was 11 of 19 on passes for 100 yards, two touchdown and one interception and ran for another 41 yards and a score in the defeat for Auburn, which was powerless in stopping the LSU running game. NORMAN, OK – Baker Mayfield passed for 487 yards on 32 of 38 with four touchdowns and ran for another 85 yards and two scores and No. 16 Oklahoma beat Tulsa 52-38 in Norman, on Saturday. Samaje Perine rushed for 152 yards and a touchdown, Sterling Shepard took 8 catches for 144 yards and Mark Andrews caught the ball three times for 87 yards and two scores for the Sooners (3-0), who put up 773 total yards. Dane Evans threw four touchdown passes for 427 yards for Tulsa (2-1), which totaled 603 yards, while Keevan Lucas had 5 catches for 84 yards and two touchdowns. Together both teams combined for 1376 total yards. Zack Langer rushed 31 times for 161 yards and a score, Keyarris Garrett caught the ball 14 times for 189 yards and Joshua Atkinson finished with 10 catches for 104 yards and a score.